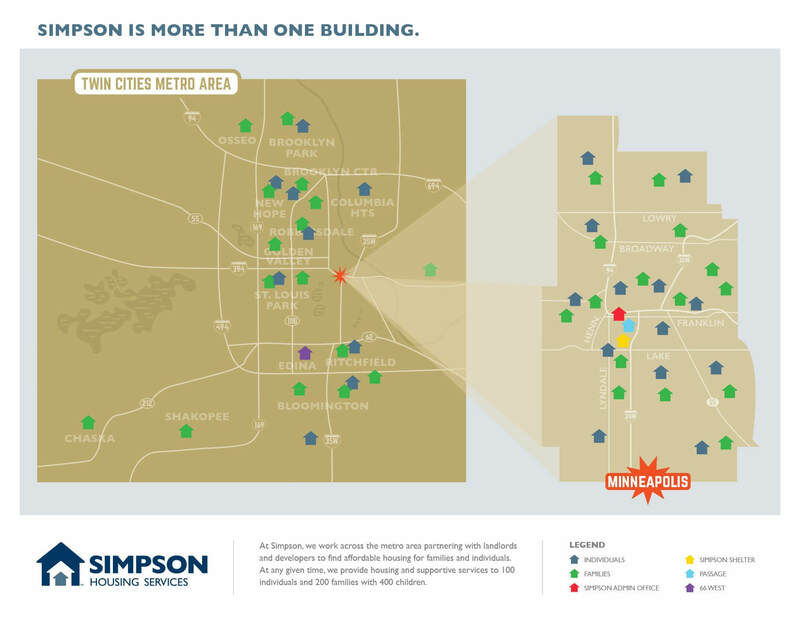 We are pleased to share the unique story of how we got to know Simpson Housing Services – a local non-profit that runs homeless shelters and assists in placing individuals and families into permanent housing – and our new symbiotic partnership! 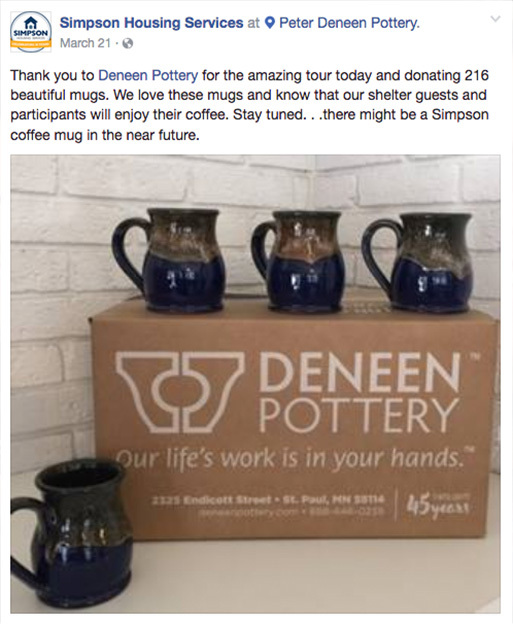 Deneen Pottery is always looking for special ways to give back to our local community. In the past we have been lucky enough to support some wonderful non-profits, such as making mugs for One Heartland and attending their gala fundraiser. We also jumped (willingly!) into a frozen lake for Special Olympics Polar Plunge and our retail page has also afforded us a platform to raise awareness and donations for The Firefly Sisterhood and Minnesota Breast Cancer Coalition. Supporting Simpson seemed like a natural fit. Quality is a core value of our family business. 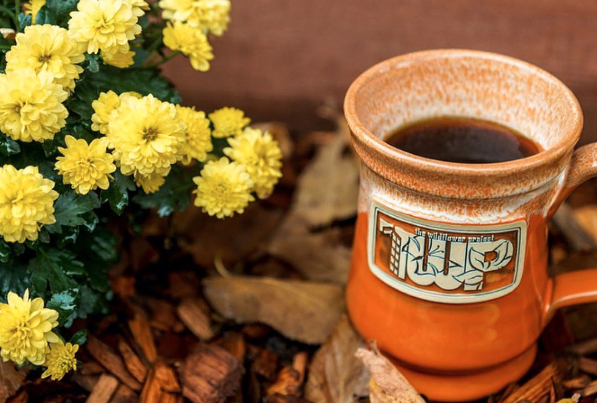 We often say: “We will be judged on the quality of the last handmade mug we ship out.” And rightfully so, because it is the last mug out of the box (or on the shelf in a store) that often prompts our customers to reorder. 1. 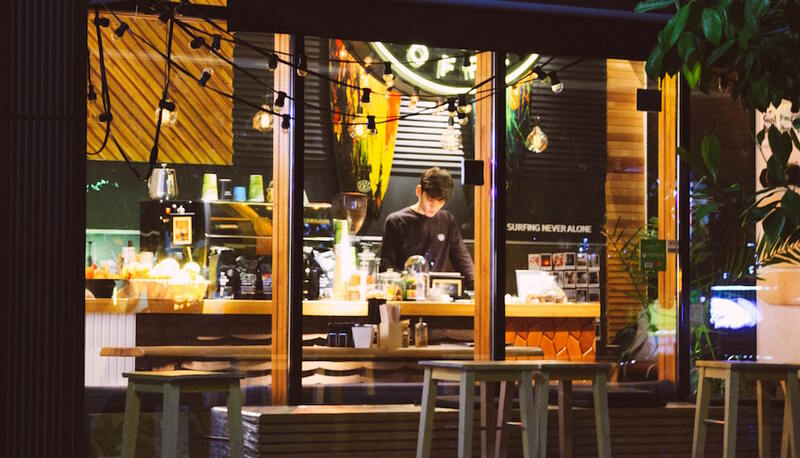 Use the less-than-perfect pieces for samples or giveaways. 2. Drop them into our mug destroying machine and pass the small pieces to our trash hauler. Mugs that don’t pass our quality control? Sometimes the flaw is so small that no one (outside of Deneen Pottery) may even notice – like a small scratch or the glaze encroaching over the medallion. Even with a super low percentage of 1.5% of our mugs not passing QC, we are now holding over 7 pallets or 5000 pieces!?! That’s a lot of mugs – that are still usable as mugs! So, for the past year we’ve been asking ourselves just what should be done with these mugs? Luckily, there is a solution that will be beneficial to all parties involved. 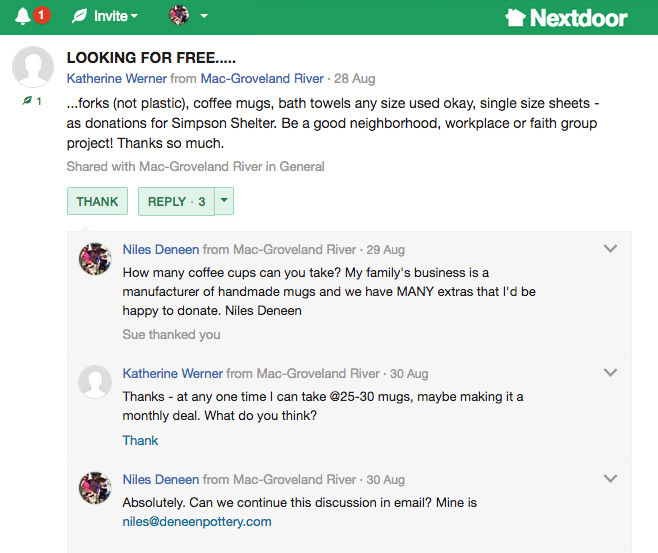 It all started last August, when I first saw this posting on the Nextdoor App from Katherine Werner. 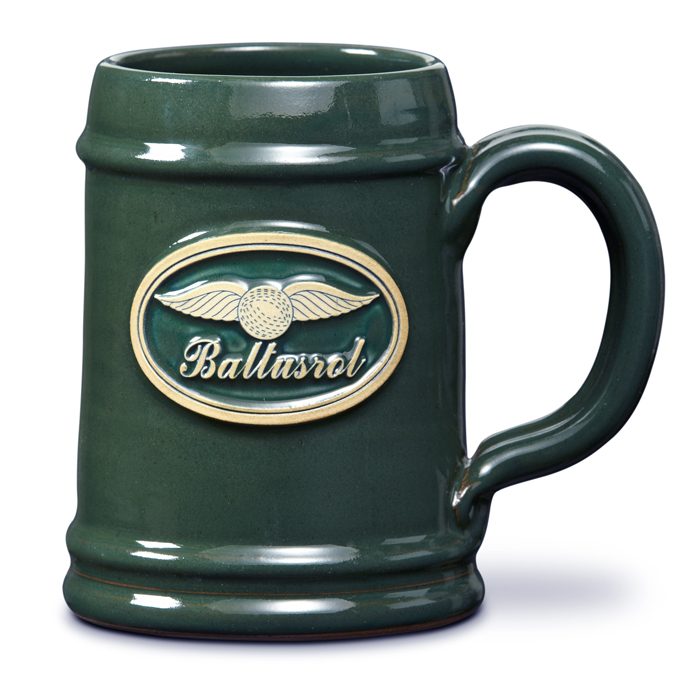 Looking for free COFFEE MUGS? We’re on it! It was clear from my early exchanges with Katherine, who suggested “maybe making it a monthly deal,” that I knew this was the answer to our extra mugs. Our donation started small, with just a couple of boxes of mugs that Katherine picked up on her way to Simpson. Shortly after her visit, we were contacted by Elisabeth Loeffler (Director of Development and Communications) and Christina Giese (Director of Volunteer Engagement) so that we could explore a more robust collaboration. I welcomed Elisabeth and Christina over for a tour our our production facility, which resulted in some wonderful conversations. When I offered to create a small order of Simpson mugs as a thank you for their service to the community – they were taken by surprise! While Simpson is known as the Cadillac of shelters, I think the true value resides in the staff and management of this amazing organization. In Robert’s office was a poster board that had a list of all the guests that have transitioned into permanent housing. It’s a real goal to have each and every guest move from Simpson into a real place of their own. The cafeteria, which is where our mugs can now be found, serves dinner for 100-120 guests every night. This is also another awesome option for community involvement as it takes a staff of 12-15 people to prepare, serve and clean up after the meal. This is an activity that we at Deneen Pottery look forward to volunteering at in the near future. Also of note at the shelter was a Public Health Clinic so that the guests can have their medical needs met. 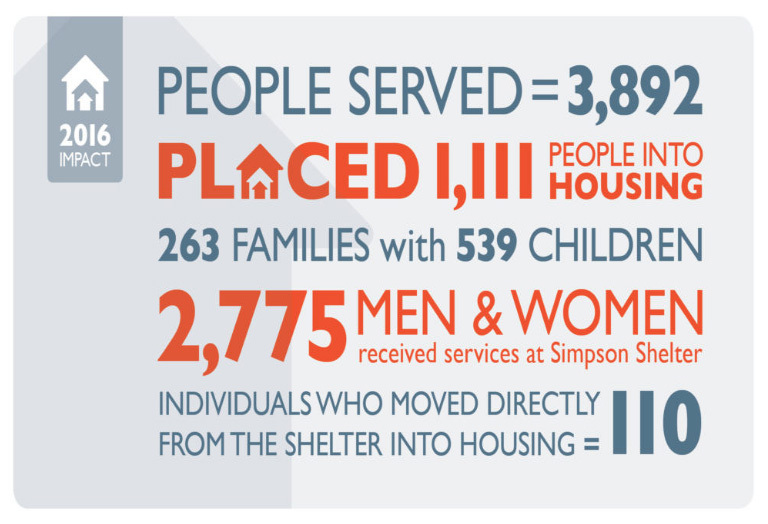 For Simpson Shelter to stay open each year they require a budget of $730,000. For $35 a night, Simpson Housing Services can provide not just a bed to someone in need, but a meal, access to laundry, toiletries, mail and a sense of belonging. Their doors are open to people experiencing homelessness 7 days a week, 365 days a year. If you are interested in learning more or would like to make a donation here’s a link – every dollar helps! We will continue to keep mugs heading to Simpson for as long as they can take them. The feeling of giving and participating with an organization like Simpson truly makes us feel lucky and valued. 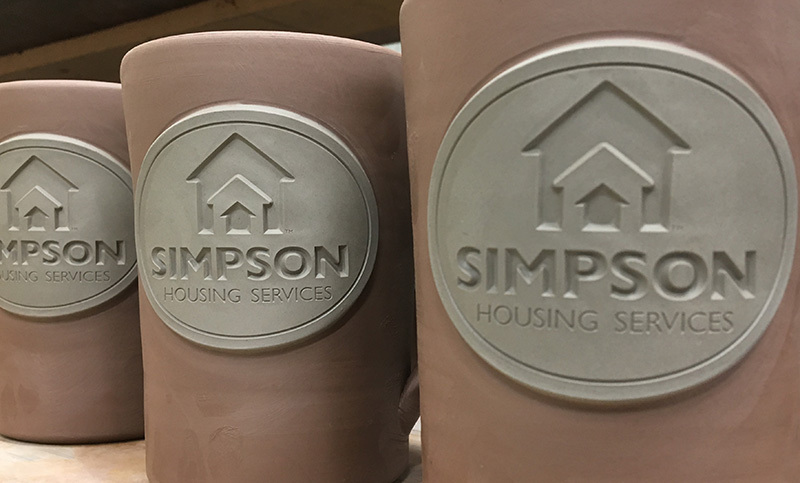 We are privileged to have this wonderful opportunity to support Simpson and their guests – and we heartily hope that they enjoy our mugs just as much as you do.